Ce document au format PDF 1.2 a été généré par / Acrobat Distiller 3.0 for Power Macintosh, et a été envoyé sur fichier-pdf.fr le 24/03/2014 à 17:03, depuis l'adresse IP 78.124.x.x. La présente page de téléchargement du fichier a été vue 616 fois. Taille du document: 498 Ko (28 pages). the old parts along for positive identification. be available under a service exchange scheme any parts returned should always be clean. vehicle is still under warranty. and greases, brake pads, touch-up paint, etc). those used by the car manufacturer. and can often be found not far from home. repair job can be purchased or ordered. crankshaft regrinding and balancing, etc. the price of a new tyre. market stalls, car boot sales or similar outlets. also of an accident causing injury or death. identification of the component concerned. concerning paint colour, final drive ratio etc. covered by a fold back plastic flap. leaks, coolant leaks, etc upon reassembly. dowels are used for component location. any burrs or nicks with an oilstone or fine file. similar in order to pull the seal free. of an assembly, it should be renewed. between the lips with grease. a hacksaw or nut splitter device. action of the bolt or stud as it is screwed in. unless stated in the repair procedure. the relevant component or housing. should be renewed as a matter of course. new ones of the correct size for the hole. could be caused to the components involved. National Rivers Authority, for further advice. valve or the hydraulic lines. maintenance and repair of a motor vehicle. of use to which these tools will be put. given in the Maintenance and minor repair list. with most proprietary torque wrenches. range of special tools for hire at modest rates. have to entrust the work to a dealer. at discount prices, so it pays to shop around. advice before making a purchase. suitable working area becomes essential. the cover of a roof. opening of 100 mm is suitable for most jobs. paints etc, which become necessary. clean, dry cloth, before putting the tools away. they cannot be damaged or become rusty. Take a little care when tools are used. restore items like this to a good finish. This is a guide to getting your vehicle through the MOT test. before submitting the vehicle for the test. publication Pass the MOT! (available from stockists of Haynes manuals). An assistant will be needed to help carry out some of these checks. M Test the operation of the handbrake. incorrect brake or cable adjustment. the security of the lever mountings. the servo itself may be faulty. looseness of the hub, spokes or rim. indicating wear or a loose retaining nut. but also turn it slightly from left to right. secure, intact, and capable of being adjusted. part of the steering or suspension mechanism. the hoses for bulges or leaks under pressure. all seat belts, front and rear. lock in the upright position. must be secure, clean and undamaged. panel or in the switch. steering pump, drivebelt and hoses. and at approximately the correct ride height. seized will also cause the vehicle to fail. suspension balljoints, or suspension mountings, pivots and attachments. torsion bars, hydraulic displacer units, etc. to the body of the unit. and securely support it on axle stands. can be turned from lock to lock. for damage or insecurity of the retaining clips. holes can often become elongated). fractured, pitted, scored or badly worn (B). front wheel, and then at both rear wheels. security of the mounting points. spring is not corroded, cracked or broken. deterioration of the flexible hoses. and does not bind when the pedal is released. pulls up in a straight line. clamps and rust or corrosion. at least three-quarters of the tread width. professional repairs are likely to be needed. will also cause the vehicle to fail. of the ply or cord due to wear or damage. carburettor or fuel system fault). August 1986 and 4.5% for older vehicles. the test is carried out. advice may be needed to find the cause. spark plugs may only be pointers to some underlying fault. have described it very accurately. indicated, look for loose or broken wires before digging out the test gear. fault diagnosis sequence just because they are new or recently fitted. that all the evidence was there from the start. m Battery terminal connections loose or corroded (“Weekly checks”). m Battery discharged or faulty (Chapter 5, Part A). m Defective starter solenoid or switch (Chapter 5, Part A). m Defective starter motor (Chapter 5, Part A). Part A and Chapter 2). m Engine earth strap broken or disconnected (Chapter 5, Part A). inhibitor switch faulty (Chapter 7, Part B). and Chapter 5, Part B). m Carburettor or fuel injection system fault (Chapter 4). Battery discharged (engine rotates slowly) (Chapter 5, Part A). Battery terminal connections loose or corroded (“Weekly checks”). Worn, faulty or incorrectly gapped spark plugs (Chapter 1). Carburettor or fuel injection system fault (Chapter 4). Major mechanical failure (eg camshaft drive) (Chapter 2). Battery discharged (Chapter 5, Part A). Other ignition system fault (Chapter 1 and Chapter 5, Part B). Low cylinder compressions (Chapter 2). Incorrect valve clearances - where applicable (Chapter 2, Part A). m Air filter element clogged (Chapter 1). inlet manifold or associated hoses (Chapter 4). m Worn, faulty or incorrectly gapped spark plugs (Chapter 1). m Uneven or low cylinder compressions (Chapter 2). m Camshaft lobes worn (Chapter 2). m Incorrect valve clearances - where applicable (Chapter 2, Part A). Faulty spark plug HT leads (Chapter 1). Incorrect ignition timing (Chapter 1). Uneven or low cylinder compressions (Chapter 2). Air filter element dirty or clogged (Chapter 1). m Starter motor mounting bolts loose or missing (Chapter 5, Part A). Fuel filter choked (Chapter 1). Fuel pump faulty or delivery pressure low (Chapter 4). Fuel tank vent blocked or fuel pipes restricted (Chapter 4). Faulty ignition coil or DIS module (Chapter 5, Part B). m Fuel filter choked (Chapter 1). m Fuel pump faulty or delivery pressure low (Chapter 4). m Fuel tank vent blocked or fuel pipes restricted (Chapter 4). Timing belt/chain incorrectly fitted or tensioned (Chapter 2). 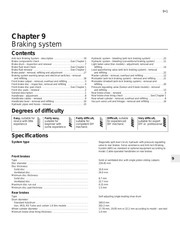 Brakes binding (Chapters 1 and 9). Automatic transmission fluid level incorrect (Chapter 1). m Ignition timing incorrect (Chapter 1). m Timing belt/chain incorrectly fitted or tensioned (Chapter 2). Low oil level or incorrect grade (Chapter 1). Faulty oil pressure sensor (Chapter 2). Worn engine bearings and/or oil pump (Chapter 2). High engine operating temperature (Chapter 3). m Oil pressure relief valve defective (Chapter 2). m Oil pick-up strainer clogged (Chapter 2). m Excessive carbon build-up in engine (Chapter 2). m High engine operating temperature (Chapter 3). m Incorrect grade of fuel (Chapters 1 and 4). system component (Chapter 5, Part B). m Leaking vacuum hose (Chapters 4, 5 and 9). m Blowing cylinder head gasket (Chapter 2). m Worn valve gear or camshaft (Chapter 2). Chapter 5, Part A and Chapter 10). m Piston slap (most noticeable when cold) (Chapter 2). Insufficient coolant in system (“Weekly checks”). Radiator core blocked or grille restricted (Chapter 3). Electric cooling fan or thermoswitch faulty (Chapter 3). Pressure cap faulty (Chapter 3). Ignition timing incorrect (Chapter 1). Inaccurate temperature gauge sender unit (Chapter 3). Air lock in cooling system (Chapter 1). m Thermostat faulty (Chapter 3). m Inaccurate temperature gauge sender unit (Chapter 3). Deteriorated or damaged hoses or hose clips (Chapter 1). Radiator core or heater matrix leaking (Chapter 3). Water pump seal leaking (Chapter 3). Boiling due to overheating (Chapter 3). Core plug leaking (Chapter 2). m Leaking cylinder head gasket (Chapter 2). m Cracked cylinder head or cylinder bore (Chapter 2). m Infrequent draining and flushing (Chapter 1). m Incorrect antifreeze mixture or inappropriate type (Chapter 1). m Broken mountings causing body or suspension contact (Chapter 1). 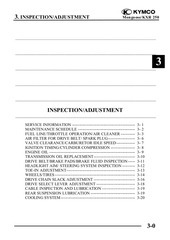 m Damaged or corroded fuel tank, pipes or connections (Chapter 4). m Clutch disc linings contaminated with oil or grease (Chapter 6). m Faulty pressure plate or weak diaphragm spring (Chapter 6). Broken clutch cable (Chapter 6). Incorrect clutch adjustment (Chapter 6). Broken clutch release bearing or fork (Chapter 6). Broken diaphragm spring in clutch pressure plate (Chapter 6). Clutch disc sticking on gearbox input shaft splines (Chapter 6). Clutch disc sticking to flywheel or pressure plate (Chapter 6). Faulty pressure plate assembly (Chapter 6). Clutch release mechanism worn or incorrectly assembled (Chapter 6). m Incorrect clutch adjustment (Chapter 6). m Clutch disc linings excessively worn (Chapter 6). Clutch disc linings contaminated with oil or grease (Chapter 6). Clutch disc linings excessively worn (Chapter 6). Clutch cable sticking or frayed (Chapter 6). Faulty or distorted pressure plate or diaphragm spring (Chapter 6). Worn or loose engine or gearbox mountings (Chapter 2). Clutch disc hub or gearbox input shaft splines worn (Chapter 6). Worn clutch release bearing (Chapter 6). Worn or dry clutch pedal bushes (Chapter 6). Pressure plate diaphragm spring broken (Chapter 6). Broken clutch disc cushioning springs (Chapter 6). depressed, possibly less when released) (Chapter 6). Worn or damaged gear linkage (Chapter 7, Part A). Incorrectly adjusted gear linkage (Chapter 7, Part A). m Lack of oil (Chapter 1). m Leaking differential output oil seal (Chapter 7, Part A). that the owner can communicate clearly with a professional mechanic. m Worn or damaged gear linkage (Chapter 7, Part A). m Incorrectly adjusted gear linkage (Chapter 7, Part A). dealer service department or automatic transmission specialist. onto the transmission by air flow. are common areas of leakage. b) Dipstick tube (Chapter 1). c) Transmission-to-oil cooler fluid pipes/unions (Chapter 7, Part B). m Transmission fluid level low or fluid in need of renewal (Chapter 1). problems which may be caused by a poorly adjusted cable. a) Engine starting in gears other than Park or Neutral. c) Vehicle moves when in Park or Neutral. d) Poor gear shift quality or erratic gear changes. m Refer to Chapter 7, Part B for selector mechanism adjustment. m Low transmission fluid level (Chapter 1). m Incorrect selector mechanism adjustment (Chapter 7, Part B). m Incorrect starter inhibitor switch adjustment (Chapter 7, Part B). check the fluid level and condition of the fluid as described in Chapter 1.
needed. If the problem persists, professional help will be necessary. m Lack of constant velocity joint lubricant (Chapter 8). m Worn outer constant velocity joint (Chapter 8). m Worn inner constant velocity joint (Chapter 8). m Bent or distorted driveshaft (Chapter 8). should be referred to a Ford dealer for diagnosis. rear brake shoes on one side (Chapters 1 and 9). 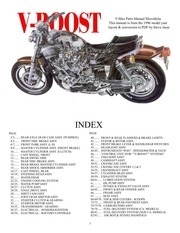 piston (Chapters 1 and 9). m Front brake caliper mounting bolts loose (Chapter 9). m Rear brake backplate mounting bolts loose (Chapter 9). backing (Chapters 1 and 9). the vehicle has been standing for some time (Chapters 1 and 9). and shield (Chapters 1 and 9). Inoperative rear brake self-adjust mechanism (Chapters 1 and 9). Faulty master cylinder (Chapter 9). Air in hydraulic system (Chapters 1 and 9). Faulty vacuum servo unit (Chapter 9). Deteriorated flexible rubber brake hoses (Chapters 1 and 9). Master cylinder mounting nuts loose (Chapter 9). m Faulty vacuum servo unit (Chapter 9). m Primary or secondary hydraulic circuit failure (Chapter 9). m Seized brake caliper or wheel cylinder piston(s) (Chapter 9). m Brake pads or brake shoes incorrectly fitted (Chapters 1 and 9). m Brake pads or brake shoe linings contaminated (Chapters 1 and 9). m Brake pad or brake shoe linings worn (Chapters 1 and 9). m Incorrectly adjusted handbrake mechanism (Chapter 9). m Faulty master cylinder (Chapter 9). m Rear brake shoe linings contaminated (Chapters 1 and 9). m Faulty brake pressure regulator (Chapter 9). m Defective tyre (“Weekly checks”). m Incorrect front wheel alignment (Chapter 10). m Accident damage to steering or suspension components (Chapter 1). steering wheel) (Chapters 1 and 10). vehicle) (Chapters 1 and 10). m Roadwheels damaged or distorted (Chapters 1 and 10). m Faulty or damaged tyre (Chapter 1). m Wheel bolts loose (Chapters 1 and 10). m Defective shock absorbers (Chapters 1 and 10). m Worn or damaged anti-roll bar or mountings (Chapter 10). m Roadwheels out of balance (Chapters 1 and 10). m Faulty or damaged tyre (“Weekly checks”). m Wheel bolts loose (“Weekly checks” and Chapter 10). m Lack of steering gear lubricant (Chapter 10). m Broken or incorrectly adjusted auxiliary drivebelt (Chapter 1). m Steering rack or column bent or damaged (Chapter 10). Worn steering column intermediate shaft universal joint (Chapter 10). Worn steering track rod end balljoints (Chapters 1 and 10). Worn rack and pinion steering gear (Chapter 10). m Tyres underinflated (wear on both edges) (“Weekly checks”). m Incorrect toe setting (Chapter 10). m Tyres overinflated (“Weekly checks”). m Tyres underinflated (“Weekly checks”). Tyres/wheels out of balance (Chapter 1). Excessive wheel or tyre run-out (Chapter 1). Worn shock absorbers (Chapters 1 and 10). faults listed under `Engine’ earlier in this Section. Battery defective internally (Chapter 5, Part A). Auxiliary drivebelt worn or incorrectly adjusted (Chapter 1). Alternator not charging at correct output (Chapter 5, Part A). Alternator or voltage regulator faulty (Chapter 5, Part A). Auxiliary drivebelt broken, worn, or incorrectly adjusted (Chapter 1). Alternator brushes worn, sticking, or dirty (Chapter 5, Part A). Alternator brush springs weak or broken (Chapter 5, Part A). Internal fault in alternator or voltage regulator (Chapter 5, Part A). m Warning light bulb blown (Chapter 12). m Alternator faulty (Chapter 5, Part A). Corrosion of bulb or bulbholder contacts (Chapter 12). Broken, loose, or disconnected wiring (Chapter 12). m Faulty voltage regulator (Chapter 12). m Faulty gauge sender unit (Chapter 3 or Chapter 4). m Wiring open-circuit (Chapter 12). m Faulty gauge (Chapter 12). m Wiring short-circuit (Chapter 12). m Blocked washer jet (Chapter 12). m Disconnected, kinked or restricted fluid hose (Chapter 12). m Insufficient fluid in washer reservoir (Chapter 1). Broken or disconnected wiring or connections (Chapter 12). Faulty washer switch (Chapter 12). Faulty washer pump (Chapter 12). m Faulty one-way valve in fluid supply hose (Chapter 12). m Horn push either earthed or stuck down (Chapter 12). m Horn cable to horn push earthed (Chapter 12). m Blown fuse (Chapter 12). m Faulty horn (Chapter 12). Incorrectly adjusted door glass guide channels (Chapter 11). Regulator seized or damaged, or in need of lubrication (Chapter 11). Door internal components or trim fouling regulator (Chapter 11). m Cable connections loose (Chapter 12). m Horn mountings loose (Chapter 12). m Wiper blades stuck to screen or linkage seized or binding (Chapter 12). m Faulty relay (Chapter 12). 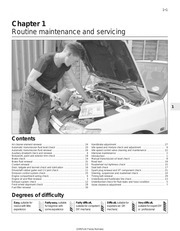 m Faulty wiper motor (Chapter 12). m Wiper arms incorrectly positioned on spindles (Chapter 12). m Excessive wear of wiper linkage (Chapter 12). m Wiper motor or linkage mountings loose or insecure (Chapter 12). m Wiper blade rubbers worn or perished (Chapter 12). m Wiper arm tension springs broken or arm pivots seized (Chapter 12). Faulty control unit (Chapter 11). Faulty master switch (Chapter 12). Broken or disconnected latch operating rods or levers (Chapter 11). m Broken or disconnected wiring or connections (Chapter 12). m Faulty solenoid/motor (Chapter 11). m Fault in door latch (Chapter 11). forward into the steering wheel or windscreen. wheels. Also called a driveshaft or a halfshaft. with hardened steel balls between two races. acting through a resistance of one ohm. prevent bolts and screws from loosening. passages and reduce cooling efficiency. exhaust manifold bolts and nuts. composition of brake friction materials. of air. Also called a bleed screw. from lines of a hydraulic brake system. that rotates with the wheels. riveted to the brake pads or shoes. the engine and the passenger compartment. of cam lobes operate the valve mechanisms. suspension and in the valve train. piston is at bottom dead centre. block in which the crankshaft rotates. where a malfunction may be located. energy of a moving vehicle into heat. compressor, etc. off the crankshaft pulley. speeds in relation to engine speeds. check or measure clearances between parts. axleshafts on a front wheel drive vehicle. slow or stop the vehicle. gases into the intake air stream. beginning with the number one cylinder. cut from the wire for replacement. piston reaches the top of its stroke. a charged or helper battery. carried by the rear axle. nut, or other threaded component, in place. prevent an attaching nut from working loose. readout is called a digital gauge. engine cylinder, brake cylinder, etc. and don’t rely on the anti-roll bar for location. produce a current of one amp. with the camshaft located in the engine block. on front-engined rear wheel drive vehicles. rods to the steering arms at the wheels. transfer agent in an air-conditioning system. the ozone in the upper atmosphere. movement to open a valve. secondary winding to the proper spark plug. wheel, shaft and turbine wheel. movement) of a gear or wheel as it’s rotated. out-of-round condition of a rotating part. cracks, the entire unit is simply replaced. instead of a series of smaller, shorter belts. changing the thickness of the shim. rocker arm. Also called a cam follower. which the temperature is regulated. clutch. Also referred to as a release bearing. if it breaks in service. another one with the same colour insulator. the best possible engine performance. exhaust gases, that pressurises the intake air. cross-shaped member called the spider. obstructs one or more ports or passageways. measured when the valve is closed. including AC, Alfa Romeo, Austin Healey, Ferrari, Lamborghini, Maserati, MG, Riley, Porsche and Triumph. of a Haynes Light 12. 25 minutes drive from the M5 intersection at Taunton. Ce fichier a été mis en ligne par un utilisateur du site. Identifiant unique du document: 00231369.